Watermelon - Cool, refreshing and totally mashable!! Summer temperatures are soaring and now is a great time to offer your baby the cool and refreshing taste of watermelon. 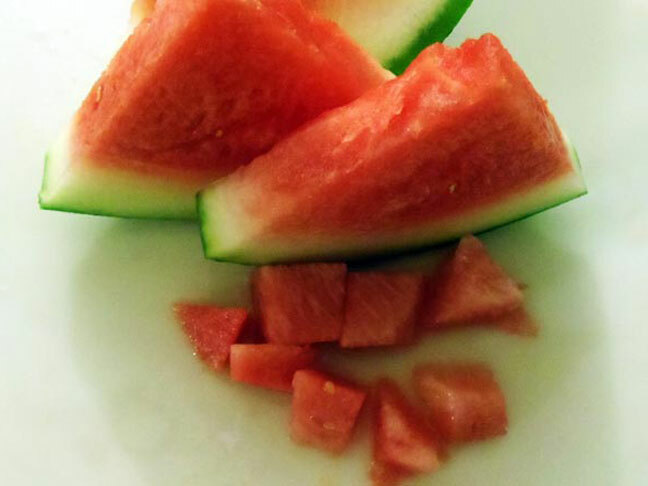 Watermelon is easily squished or mashed and this makes it a great summer treat for babies. High in Vitamin A, Vitamin C and even Calcium, melons of all types have an amazing concentration of beta-carotene making them a must have for healthy vision and eye development. Just 1 cup of diced watermelon contains 11 mg of Calcium, 865 IUs of Vitamin A and 12 mg of Vitamin C. Melons are a healthy and nutritious fruit option for your little one. Soothing and watery, full of beta carotene, melons are sure to be one of baby's favorite foods. When can your baby have watermelon and other melons? Melons may be introduced to a baby from around 8 months of age. Some pediatricians say you may introduce it as early as 6 months of age. Please be aware that some babies may experience rashes from melons. One of my twins would have a rash from watermelon and cantaloupe while the other twin never was troubled; we introduced melons around 8 months of age. It was not until my twin was almost 1 1/2 years old that he could tolerate melons without getting a rash. As always, please ask your pediatrician about introducing watermelon. Make this melon dish and serve to little self-feeders and those who enjoy texture, lumps and bumps in their foods, You may also puree this if desired. If you want to puree, simply place the fruits into your choice of appliance for pureeing and puree as needed. There should be no need to add liquid though you may add cereal (if desired) to thicken it up.